We like our meat really rare, so this was perfect for us. Typically, medium-rare is preferred. 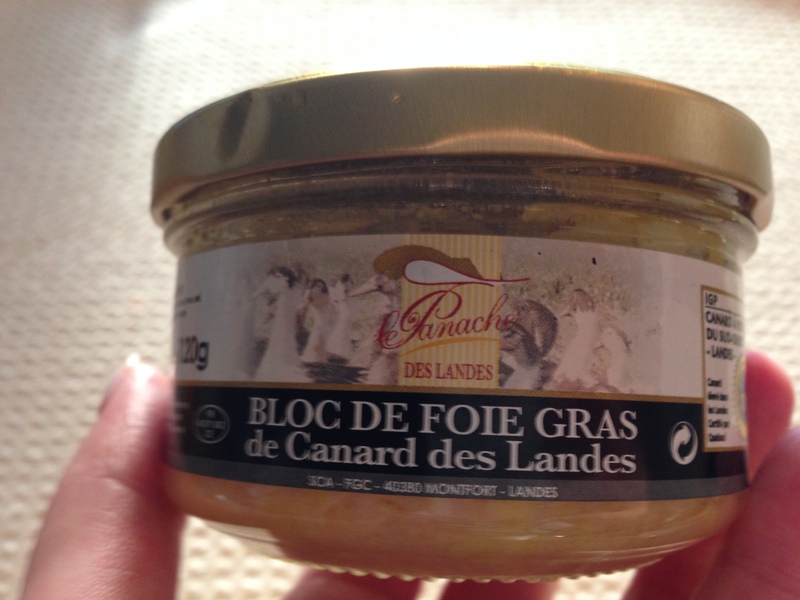 When my mother-in-law brought home foie gras paté from a trip to France, I was over the moon excited to eat it! I knew I had to do it justice, so I saved it for a special occasion and used it to attempt my first beef wellington. Luckily, it was a huge success and my sister- and brother-in-law both claimed that it was way better than the beef wellington they ate at one of Chef Ramsey’s restaurants. I really encourage you to try this at home, because 1. it’ll be just as delicious with affordable pate, 2. it’s very impressive and perfect for special occasions, and 3. it is surprisingly easy to make! 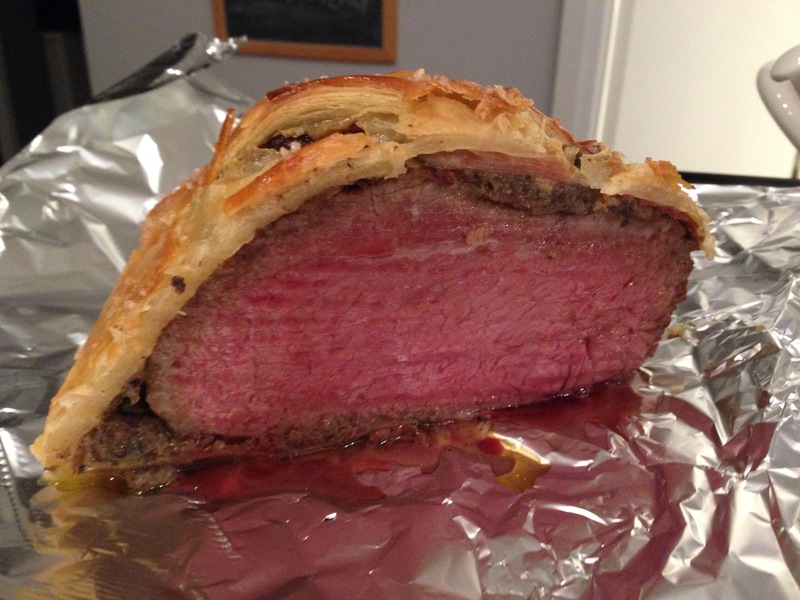 Cooking shows led me to believe that only the most highly trained chefs are capable of pulling off beef wellington. Not true at all. Anyone can make this! My mother-in-law prefers medium-rare, so we threw the rest of the beef wellington back into the oven for a few more minutes. The best souvenir from France and the inspiration for this meal. 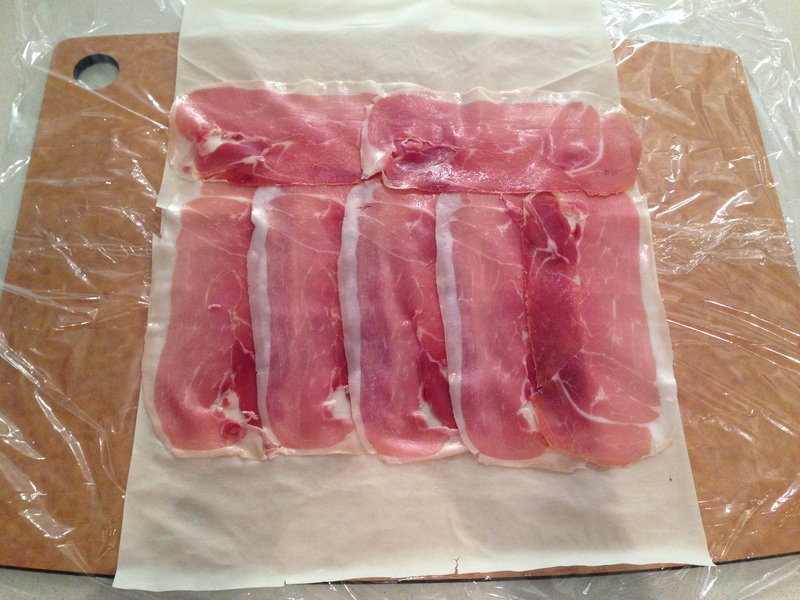 Layers shown from bottom to top: syran wrap, 1 layer of phyllo pastry, 1 layer of slightly overlapping prosciutto. Layers shown from bottom to top: syran wrap, 1 layer of phyllo pastry, 1 layer of slightly overlapping prosciutto, spread of foie gras paté. Note: Don’t use a roasting rack like I did. The puff pastry on the bottom sinks into it as it bakes. Pat the tenderloin dry with paper towels, then season with salt and pepper. Heat a cast iron or heavy-bottomed skillet over high heat. Then add enough oil to coat the bottom of the pan. As soon as the oil hits smoking point, place the tenderloin in the pan. Don’t move it until the first side is nicely browned, up to 2 minutes. Then rotate the tenderloin and repeat this step until all sides have been browned. Transfer the meat to a large plate and set aside. In a small bowl, stir together 3 tablespoons of dijon mustard and 1 teaspoon of black pepper. Then, when the tenderloin is cool enough to handle, use the back of a spoon to spread this mixture all over the tenderloin. Use more dijon mustard as needed. Place the tenderloin in the refrigerator, uncovered. Place half of the mushrooms in the bowl of a food processor fitted with a metal blade. Pulse until the mushrooms are finely chopped. Scrape down the sides of the bowl with a rubber spatula as required. Transfer to a bowl and repeat this step with the remaining mushrooms. Place the onion in the food processor and pulse until finely shredded. Then transfer to the bowl with the mushrooms. Heat a skillet over medium-high heat and add the butter. Once the butter has melted, add the mushroom and onion mixture. Cook, stirring occasionally, until all of the liquid has evaporated, the mushrooms start to brown, and there are brown bits stuck to the bottom of the pan. You want the mixture to be very dry, but not burnt. Then add the brandy or stock to deglaze the pan. Scrape up the brown bits from the bottom of the pan and cook until almost all of the liquid has evaporated. Then add the heavy cream and soy sauce and cook, stirring frequently until the mixture is very thick and stays in a large mass even when you shake the pan. If your mushroom mixture is too wet, your puff pastry will be soggy. Place two layers of plastic wrap, about 2 feet x 2 feet on a large cutting board. Lay one sheet of phyllo pastry dough on top of the plastic wrap, in the middle. Ensure that there are no tears in the phyllo as this will help seal in the steam and juices from the meat so that the puff pastry stays crispy. Then place the slices of prosciutto on top of the phyllo pastry in a thin, even, layer with each slice slightly overlapping the previous one. Leave a 2-inch border along the top and the bottom of the phyllo. Ensure that the prosciutto layer is large enough to completely wrap around the tenderloin. (Note: If it isn’t large enough, place a second sheet of phyllo dough on the plastic wrap, overlapping the first sheet of phyllo by about an inch, and add more prosciutto as needed. Then cut off the excess pastry dough.) 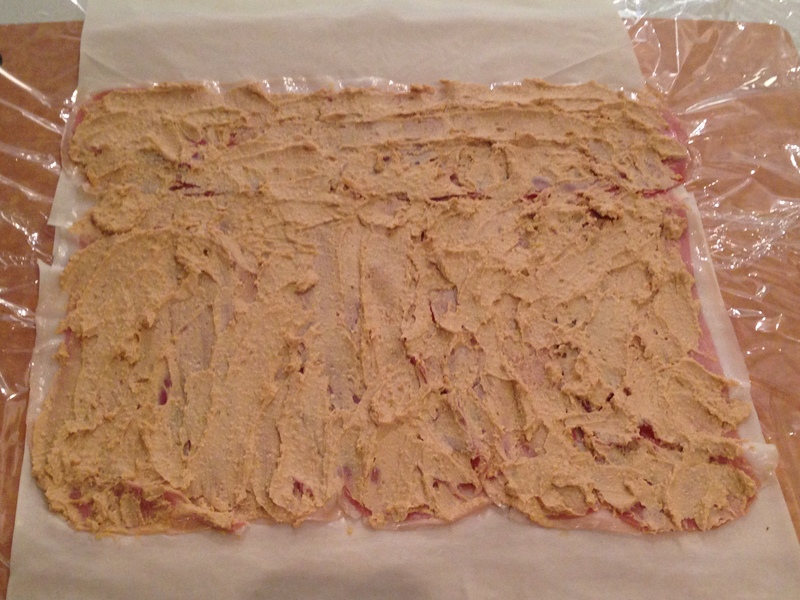 Spread the paté in a thin and even layer over the prosciutto. Finally, spread the mushroom mixture in a thin and even layer over the paté. Place the chilled tenderloin along the bottom edge of the layers. Lift up all of the layers and use the syran wrap to roll the tenderloin up in the phyllo, prosciutto, paté and mushroom layers. Be sure to use the syran wrap to wrap the tenderloin and layers very tightly. The technique I used is very similar to how I use a bamboo mat when making Japanese maki rolls. Ensure that there is enough phyllo to completely encase the meat in a single one layer. Cut off excess phyllo as needed. Then twist the ends of the syran wrap very tightly. Use additional sheets of syran wrap if needed to seal the roll tightly. Return the tenderloin to the refrigerator until it has completely chilled through. Note that you could make this one day in advance. About an hour before you’re ready to put the beef in the oven, dust a large cutting board or counter top with flour. Use a rolling pin to roll out the puff pastry until it is a rectangle that is wide enough to wrap the entire tenderloin. When rolling the dough, to prevent sticking, use the rolling pin to roll outwards (i.e. upwards) starting from the centre. Then pick the dough up off the board, turn it 90 degrees and repeat, adding light dustings of flour to the board and/or to the top of the dough as needed. Remove the plastic wrap from the beef roll. Place the rolled-up beef along the bottom edge of the puff pastry with the top of the roast facing up (i.e. phyllo seams down). Roll the beef with the puff pastry until the log is completely wrapped up. Ensure that the top of the roast is facing up with the puff pastry seam on the bottom. Use a sharp knife to cut off excess dough. Use your fingers to pinch and press the seam until it is sealed. Now to seal the puffy pastry on both ends of the log. The technique is similar to wrapping the end of a present. Starting with one end, pinch and press the excess puff pastry from the left and right side of the log towards the centre. Use a sharp knife to trim the bottom flap of excess pastry dough and fold it up towards the centre. Then fold the top flap of puff pastry down, over the end of the log, and under the bottom of the log roll. Pinch and press to seal the seam. Repeat for the other end of the log. Transfer the log to a plate, with the top of the roast facing up and the seams on the bottom, and chill for at least 30 minutes. Remove from the oven and carefully transfer the wellington to a carving board to rest for a few minutes. Using a large, sharp knife, slice off the ends of the wellington and then carefully cut the wellington into slices. Serve immediately.